Whole of India is bidding adieu to Lord Ganesha on Tuesday, and Bollywood is no exception. Bollywood celebrities also celebrates Ganpati Visarjan with full joy and excitement every year. The entire nation is bidding adieu to Lord Ganesha on Tuesday, and Bollywood is no exception. Bollywood celebrities also celebrate Ganpati Visarjan with full joy and excitement every year. 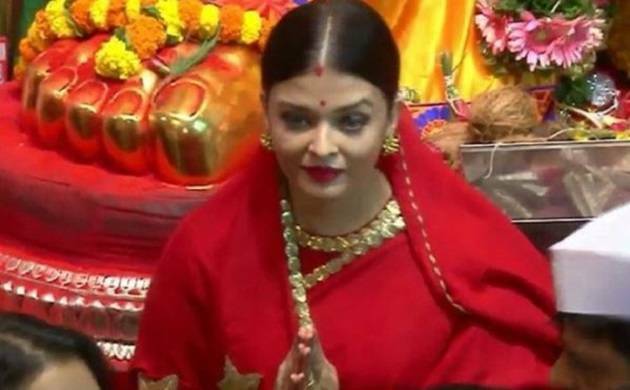 Former Miss World Aishwarya Rai Bachchan was also among the celebrities who visited Mumbai’s Lalbaugcha Raja along with her husband Abhishek Bachchan. The Bachchan family has devotion for Lord Ganesha and the family always visits Lalbaugcha Raja during Ganesh Chaturthi. She was dressed in beautiful red saree with golden embroidery which caught all the attention. On the work front, Aishwarya Rai Bachchan is busy shooting for her next ‘Fanney Khan’ which also stars Anil Kapoor and Rajkummar Rao. There were also reports that Abhishek and Aishwarya may be casted in the same film together. Later, the actor cleared the facts by saying, “In between, there was some talk that a remake of the movie should be made with Aishwarya and I. But we both thought that it was such a good movie, so we shouldn’t make a remake. Certain films...you should just leave them alone, you can’t remake them. There is a magic about them that should be left. So as of now, nothing of that sort’’. Her last screen appearance was in Karan Johar’s ‘Ae Dil Hai Mushkil’ which also featured Ranbir Kapoor and Anushka Sharma in lead roles.